Who doesn’t love a good fireworks show?! Happy Fourth of July, everyone! 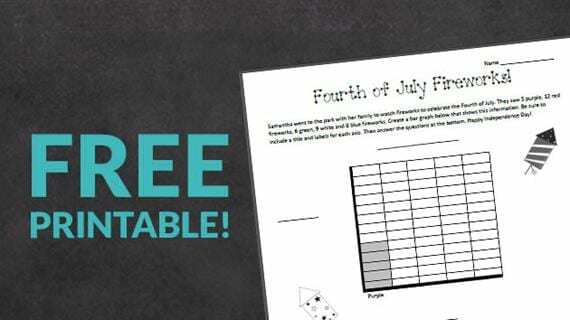 This week’s printable is about one of the best parts of America’s Independence Day celebration: fireworks! Who doesn’t love a good fireworks show?! 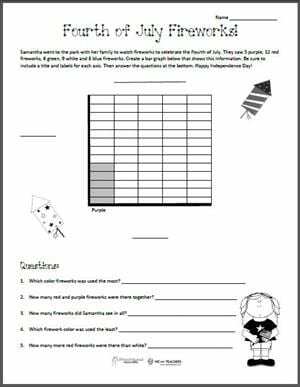 Geared toward second- and third-grade students, this printable asks students to create a graph (with a single-unit scale) and then answer questions about the data. For an extension activity, ask students to record what color fireworks they might see over the holiday weekend and then create a graph with the collected data next week. If you’re not near a place where kids can see fireworks, encourage students to collect data on something else. I’ve found that data studies are more interesting and meaningful if you collect data in the students’ own environment. Have a fabulous Fourth!